It had been nearly a year since I entered Ironman UK and during the course of those 12 months it has never been far from my mind. Now finally it was here. 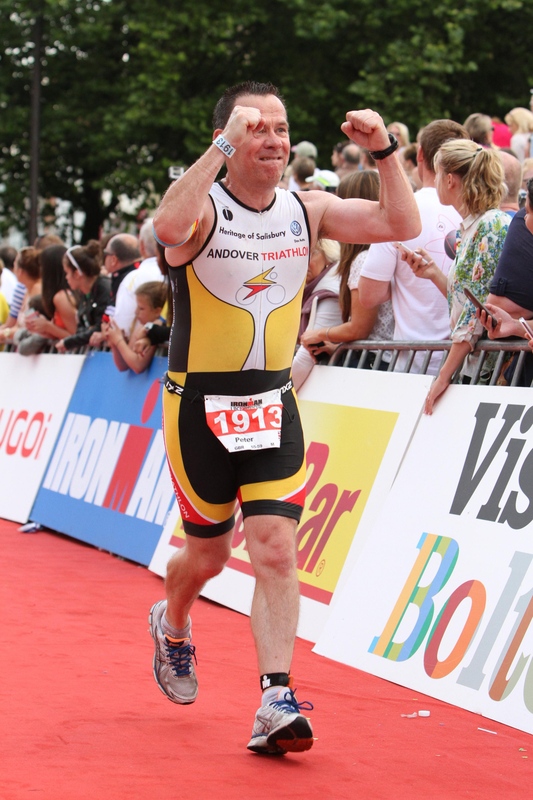 From the start of Ironman UK race week this felt very different to anything I had done before. I managed to keep my nerves in check, but was glad when the time came to travel to Bolton on Friday, arriving in time to register and attend a race briefing. Saturday was busy delivering my bike and transition bags to the right places. It was when I arrived at Pennington Flash to rack my bike that the scale of the event first hit me and the nerves stepped up a notch. Sunday morning couldn’t come fast enough. On Saturday evening we had dinner with my club mate Carrie Power who was also competing. Carrie had registered a DNF at Ironman Switzerland in 2013 and had lived with the disappointment for a year. Sunday was all about laying that ghost to rest for her. As we waded through a mountain of pasta, I could sense Carrie’s single mindedness. What’s the saying about a woman scorned? Ironman didn’t stand a chance! Even by triathlon standards the alarm call on Sunday was early. My alarm was set for 3.00am so I could catch the shuttle bus to Pennington Flash at 4.00am. As usual, I was awake well before that. I had managed about 4 ½ hours of fitful sleep – hardly the perfect preparation for the long day ahead. Cate and Matilda, my Iron support crew, dutifully got up at 3.30am and drove me to the Reebok Stadium and waved me off. Three hours later I was standing in a queue of 2,000 very nervous wet suited competitors waiting to be allowed into the water. With over half of the field doing their first Ironman the atmosphere was incredible. As we waited, standing next to me was none other than Andy Holgate, the triathlon author, whose book about his journey to Ironman had given me real encouragement to do this. I asked him if he would zip up my wet suit. I told him that it was partly his fault that I was there, so it was an appropriate last act before we started. He laughed and did me up before shaking hands and wishing me luck. What a nice guy! As 2,000 of us trooped into the water my nerves turned to excitement. I soaked every moment of it in, it was exhilarating. I swam about 250 yards out towards the start line and picked a spot in some space. I looked behind me to see a huge crowd of people treading water. I was somewhere in mid pack – about 1,000 in front and 1,000 behind. This was going to be interesting! They played the national anthem – very American. Then I heard the PA system announce 10 seconds to go and the huge crowd on the shore cheer. No turning back now! Then a loud hooter. Ironman UK was underway, the start of a very long day. The noise was incredible as 2,000 people burst into action – the world’s biggest washing machine! For the first few hundred metres there was no room at all. I got clattered a few times, but nothing too bad. By about 600 metres I had found some room and some rhythm. The next challenge was the first turning buoy at about 900 metres – having spread out a bit, hundreds of people swimming around me were now all heading for the same 20 feet of water. I decided to go round as close as I could to the buoy. I wasn’t the only one – at one point you could have walked over the raft of bodies, but we all got round in one piece without any dramas. In what seemed like no time I was at the exit at the end of lap one – 1.2 miles (1.9k) done. As I ran the small stretch on land I saw the race clock – 37 minutes – about what I would have expected. The second lap was much less congested and I hit a really steady rhythm and certainly didn’t feel as though my pace dropped. As I approached the exit for the last time, I heard the announcer over the PA and the cheering crowd from about 200 metres out. I kept swimming right to the exit ramp before I stood up unsteadily. A volunteer reached his hand out and I grabbed it gratefully. He pulled me up the ramp and seconds later my feet were on terra firma. One Ironman swim done! 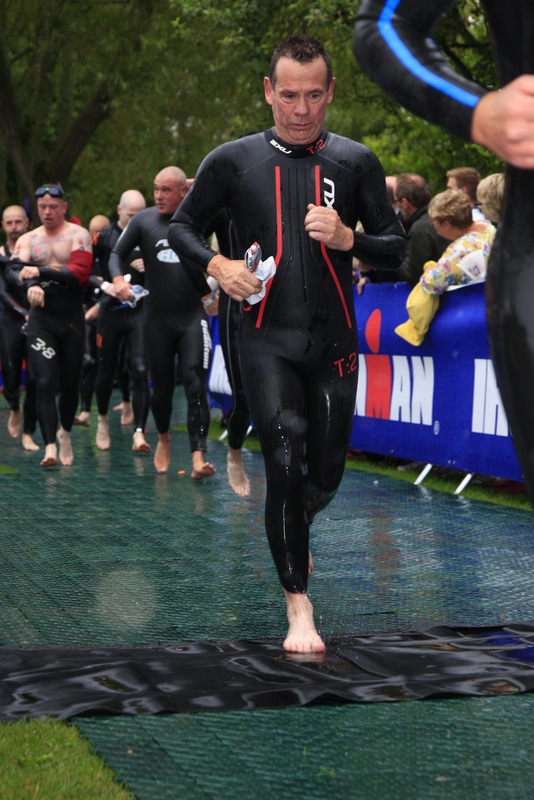 As I ran to T1 grappling with the zip on my wet suit I passed the race clock again – 1.21 hrs. I was surprised that my second lap had been slower – but 1.21hrs would do. Much more exciting was seeing Cate and Matilda for the first time cheering madly holding up their “Go Dad” banner. It was a real boost. Then it was time to think about the bike. Ironman style transition with kit bags and changing tents make fast transition difficult. I was in and out of the tent and onto my bike in 6 minutes which was fine. The bike course was a 14-mile point to point section which joined what everyone referred to as “The Loop” – a circuit of just under 50 miles that we had to do twice. 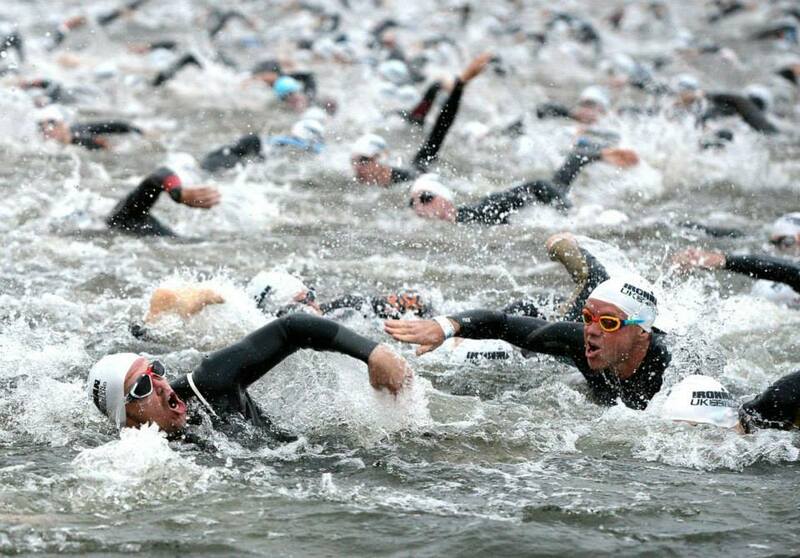 It was crowded to begin with as hundreds of competitors poured out of the swim venue and in the shake down of slow swimmers who were fast cyclists racing through the field, I saw several crashes. We reached the The Loop in a bit less than an hour and were straight into the first of two climbs – Sheephouse Lane. It wasn’t a steep climb, just long and relentless. As I approached the top I was distracted from the pain by 4 men at the side of the road dressed only in mankinis and coloured wigs, dancing to thumping music coming from their camper van. Was I hallucinating or had the world briefly gone mad! At about the 30-mile mark I caught Carrie and rode with her for a quick chat. She’d had a stellar swim finishing in 1.09hrs and was feeling good on the bike and seemed in good spirits. That was all I needed to know. We wished each other luck and I pressed on. By the time I started the second lap it was late morning and large crowds had gathered at the best spectating points. By far the highlight of the bike course was Babylon Lane or “Colt Alley” as it has become known on Ironman race day. The hill out of Adlington had been taken over by Colt tri club and friends – several thousand of them lined the route pressing right into the road leaving only a few metres for competitors to cycle through. The noise was deafening, this was the closest thing I will ever experience to riding a climb on the Tour de France. It was awesome – a real goose bumps moment. Finally at about 2.30pm and after just over 7 hours on the bike, 112 miles and 6,751 feet (2,058 metres) of ascent, I pulled into T2 at the Reebok Stadium. I love my TT bike but I wasn’t sorry to hand it to a bike catcher and head into the changing tent. I was tired but ecstatic to have the bike leg behind me. I got an extra little boost when I looked around and saw that the bike racking in T2 was still less than half full. Two down and one to go – even if that one was a marathon! Once again transition took 6 minutes – nothing if not consistent! 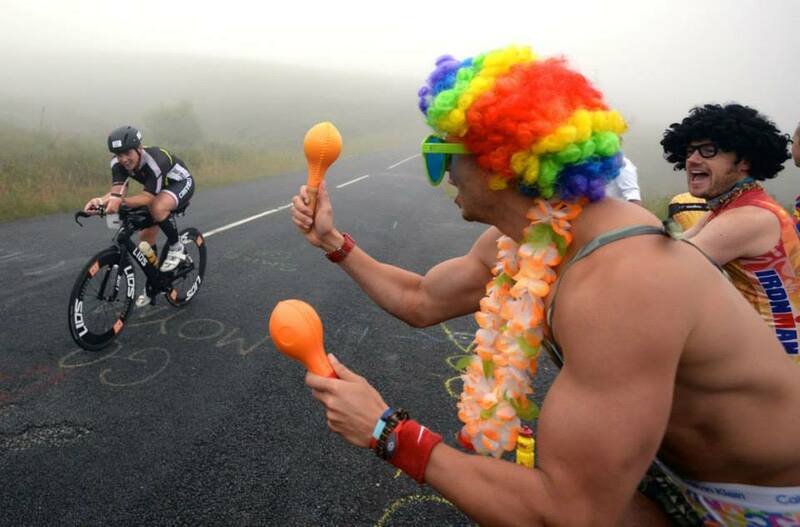 The run course of Ironman UK was brutal – there is no better word to describe it. When I think run, I think flat, but not in Bolton! The run started with a quick taste of things to come – straight into a hill. But despite the ascent it didn’t take long for my legs to feel something like my own. The run into Bolton is partially along the tow path of the canal where I took a short break and walked with two guys from Team True Spirit, the club that gives recovering injured servicemen the chance to take part in events like this. We chatted as we walked and despite their obvious injuries, all these guys wanted to know was how I was doing. Two humble but deeply inspirational human beings – suddenly my aching legs seemed unimportant. After a while we all wished each other luck and I ran on with tears in my eyes. What a moment! It cost me a minute on my race time, but a minute that will inspire me through challenges for as long as I continue to take them on. Once I reached the loop in Bolton town centre the whole mood changed. I felt as though I had arrived at the party! The first lap was fun. The entire run loop was lined with supporters cheering and encouraging and the closer you got to the centre of town and the finish, the bigger the crowds became. Coming out of town was a different story. It started with a sharp hill followed by a short flat section to get your breath back then a steady incline for most of the rest of the outward part of the loop. The 26-mile run had a total of 1,000 feet of ascent. As more and more runners joined the loop the atmosphere built. I have many great memories of the run – the crowds of young spectators outside the pub halfway along who got drunker and more encouraging with each lap – meeting numerous people who I had been virtual friends with on Facebook until now, but who became real friends in Bolton bonded by our common struggle – my old friend Taff Davies who I haven’t seen for over 20 years introducing himself to the race booming out “Come on Whenty” across the run course. When I was about half way through my first full lap I finally saw Carrie on the run coming the other way and stopped for a chat. She had made it through the bike leg which had been her nemesis in Switzerland – I couldn’t have been more pleased. But seeing Carrie had only briefly distracted me from how hard things were becoming. 15 miles into the marathon, I had been on the go for over 10 hours and my body was beginning to object violently. Whoever you are, an Ironman ultimately boils down to a moment when your body says no and you have to find a way to say yes. It happened to me about 18 miles into the run, on my second lap. From then on it was one long negotiation. I seemed happy if I knew when the next walk would be. I set landmarks: “Run to those traffic lights half a mile away and then walk for 20 seconds, then run to the next feed station half a mile further on and walk through it” and so it went on. I don’t think I let myself off lightly, but I definitely slowed on the last third of the run. My legs were close to shot, they had been propelling me forwards for about 11 hours. My feet felt like a bomb site – I shuddered to think what I would find when I eventually peeled my running shoes off later. But somehow I kept myself moving forward – I can’t explain how, it’s just the way you’ve wired yourself for this day. Eventually I found myself running to the turning point at the far end of town for the last time. I passed through the penultimate aid station and fuelled up for one last effort. Then I ran the 100 metres to the turnaround, ran over the timing mat and turned for home – 2 ½ miles. I chatted to another runner as we both headed for the finish. We agreed that running downhill back into town should have been a pleasure but it wasn’t – it hurt. Past the supporters at the pub who by now were feeling no pain – 2 miles. Down the steep hill into town and into the final feed station – just a cup of water this time – ½ mile. As I left the feed station I could hear the announcer at the finish line. For the first time I started to celebrate, I was going to do it. 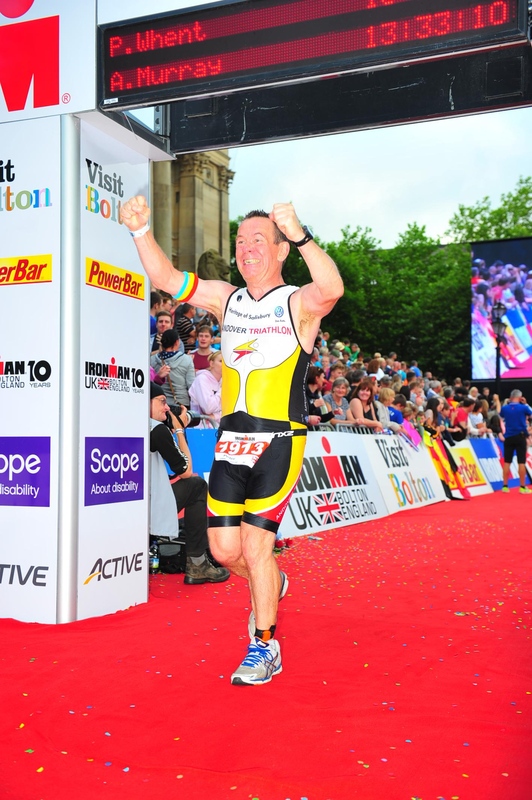 I ran round the corner, into Victoria Square and there was the finish – 200 metres of Bolton’s dusty cobbles were all that stood between me and my Ironman dream. I ran into the top of the long winding finishing chute and looked around for Cate and Matilda. I had to see them before I crossed the line. Apart from living this whole thing with me, they had both been up since 3.30am standing on the side of roads around Bolton cheering me on – Iron support – this was as much their moment as it was mine. They weren’t hard to spot – Matilda was doing a passable impression of Animal from the Muppets trying to attract my attention. I ran across to them for a big sweaty family hug. Cate was more concerned that I hadn’t finished yet but for these few seconds the clock could tick – I was where I wanted to be. And then came the moment. 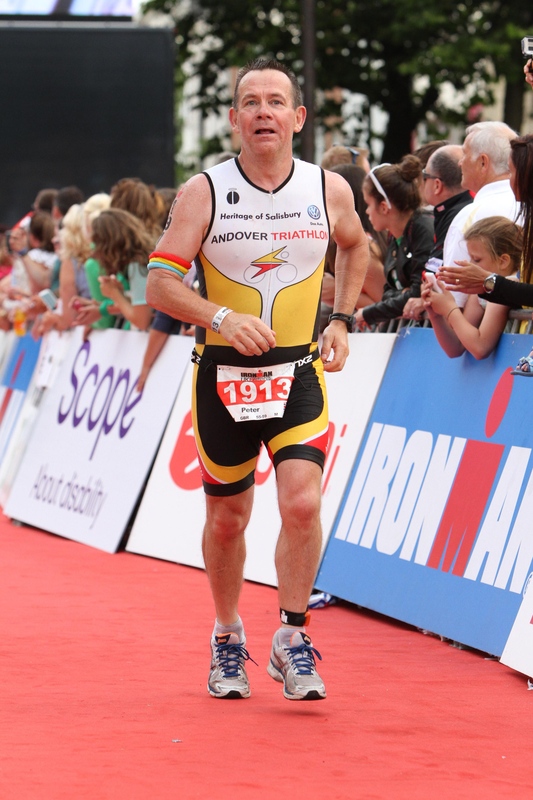 I ran slowly down the red carpet urging the crowd on, round the corner and there was Paul Kaye, the Ironman announcer. As I ran past him to the finish line he gave me a high five and I heard him say over the PA system; “Enjoy your finish Peter, YOU – ARE – AN – IRONMAN.” I had done it. 13 hours and 33 minutes after I had started in Pennington Flash I had finished. I was an Ironman! My marathon had taken 4.48hrs. A volunteer hung a medal around my neck. There was no outpouring of emotion, just a real sense of achievement. In the athletes tent after the finish line there were about 20 other finishers, most of whom were sitting down staring a thousand miles into the distance. Their bodies had done their jobs and had now shut down. After 13.33hrs I am an Ironman! On offer was all the Dominoes pizza you could eat. In my case that amounted to precisely none! After 20 Powerbar gels and heaven knows how much energy drink my stomach was closed for business. Just a bottle of water to celebrate!! I was soon reunited with Cate and Matilda and then the celebrations could really start! I also caught up with my old mate Taff. I wanted to stay and watch Carrie finish, but I had a 12-year old on my hands who had been awake since 3.00am and was dropping. Reluctantly we headed back to the hotel, but I followed avidly online and celebrated as she crossed the finish line about an hour and a half later. One ghost laid to rest! We all had a great celebration breakfast in our hotel the next day. The next morning I was wide awake at 5.00am. As I lay in bed reliving the events of the day before, I felt a real sense of satisfaction and pride. 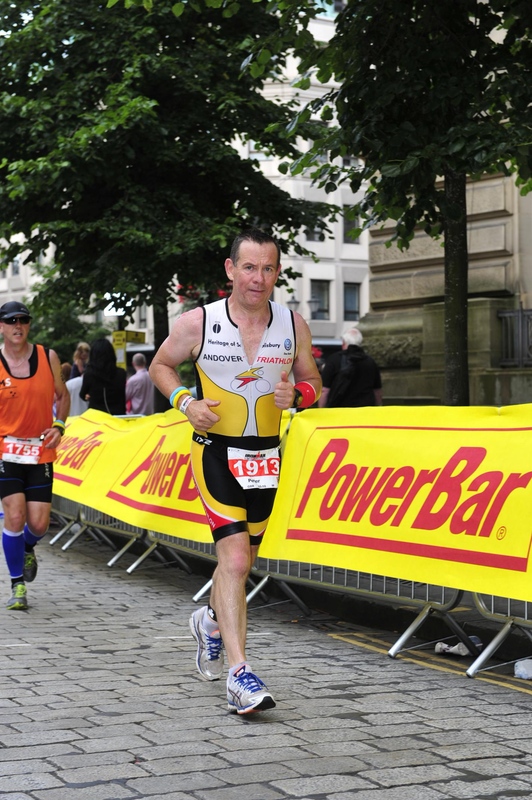 I hadn’t come to Bolton to qualify for Kona, or to win a prize or even for a fast time. I came looking for the answer to a question: When I push myself to my limits and I am staring into the abyss, have I got what it takes? The answer came at about 7.30pm on Sunday evening when I heard those four words. 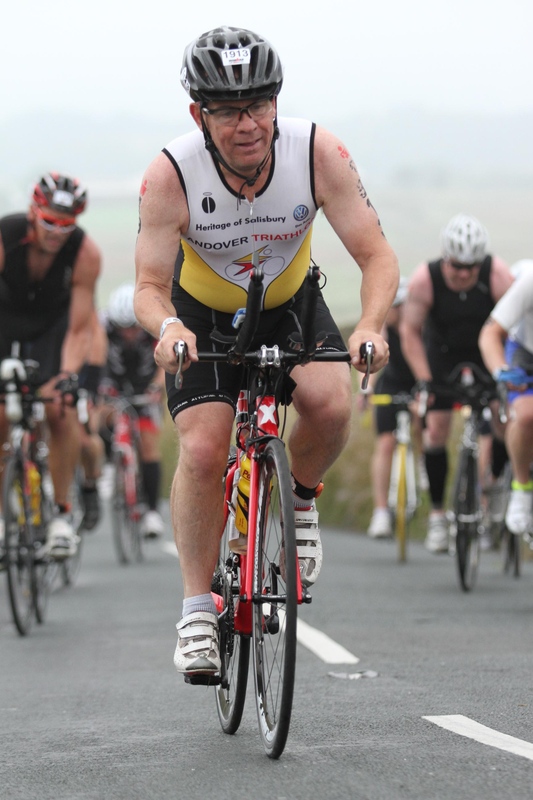 This entry was posted in Uncategorized and tagged 140.6, Andover Triathlon Club, bike, ironman, Ironman Bolton, Ironman UK, Peter Whent, run, swim. Bookmark the permalink. Nice to meet you my virtual friend ! Virtual no longer!! Thanks for your comment and congratulations again on your finish – especially given that you did half the swim, the bike and the run with two cracked ribs. Awesome effort. Unbelievable and inspiring. Bloody well done. And being completely honest, reading this brought a manly tear to my eye. I’ve also forwarded this to a dozen friends and family. Shear mind over matter. Congratulations, a truly mammoth achievement, well done. Beer? Thanks Miley – unbelievably I enjoyed it. Maybe not all at the time, but looking back it was an incredible experience. I’ve even said the words “next time” but not yet to Cate!! Would love a beer. Fantastic achievement! Fantastic race reprt, I was smiling as I read it. I don’t know how you did it! (Well I do, lots of training grit and determination!) but I so respect that fact that you have done the training and succeeded! Thank you for your kind words Julie and for your constant support and encouragement. It has really helped me. I am so grateful to you for coming to watch on Sunday. I am sorry I didn’t see you. I hope you enjoyed it. I have to say that the people of Lancashire did us proud. They were most friendly and welcoming group of people over the whole weekend and made it the event it was. Thank you Mo. I’d be lying if I said I loved every moment, but it was an awesome and unforgetable experience. How are things with you? Slow, in both pace and responding! Apols, been offline for a while. Still swimming when I can though. An amazing achievement! 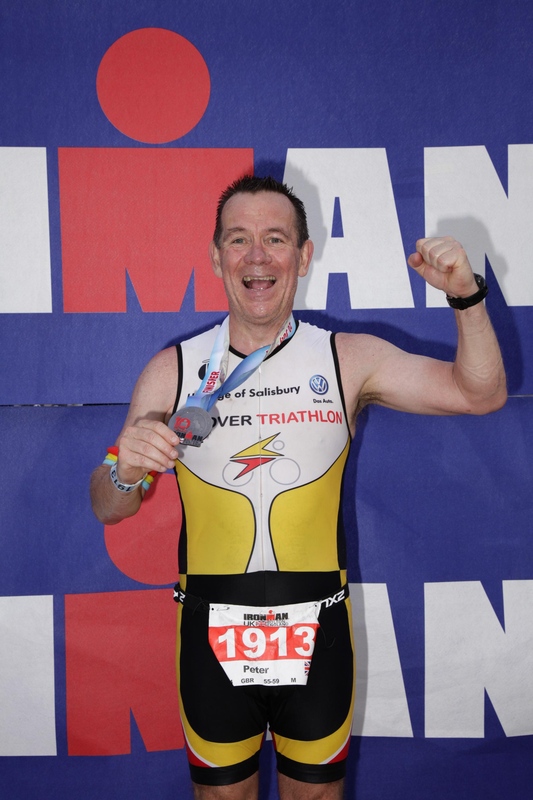 Congratulations on becoming an Ironman and thank you for the blogging about the experience. It was fun to read. Just brilliant Peter! I was tracking on the day as I knew a few people taking part and was cheering you on all afternoon. It’s an incredible achievement – now that it’s sunk in I hope you’re really proud of what you did out there. Amazing stuff! Absolutely amazing thank you. We loved it! Hi Peter – what a great blog to finish your fantastic journey and congratulations again. Once the dust has settled and you’ve decided what your next challenge is, it would be great if you could keep blogging. Thank you David and thank you also for all the support you have given me – not least on the day on the run course. It was great to meet you. I will continue blogging – I am only 3 1/2 years into this journey – I am nowhere near finished with it!!! Peter that was a bloody marvellous recap. Many many congratulations on your feat. You. Are. An. IRONMAN! Thank you for your kind comments Bernie – it was a bloody marvellous day!!! Really unforgettable. Thanks Alex. Patrol report?……I couldn’t possible comment 🙂 See you soon. Well done Daddy! You are right the day was very long, but very fun and enjoyable, at least for the spectators!! I loved hearing The race report from the ironman himself. Another huge well done to you, and to Carrie, it is a huge achievement. Hope you have recovered well and weren’t too sore afterwards. I found your blog when I googled swimming panic attacks. I am so impressed with how far you have come and so quickly! A huge congratulations! Thank you for your kind comments Andrea. It has been a labour of love – I have enjoyed it all. If you were researching panic attacks because you have had one, rest assured they will go away. I found that getting into open water once a week soon got me past them. Good luck!! Super write up! I was a bike catcher volunteer at this years IM. 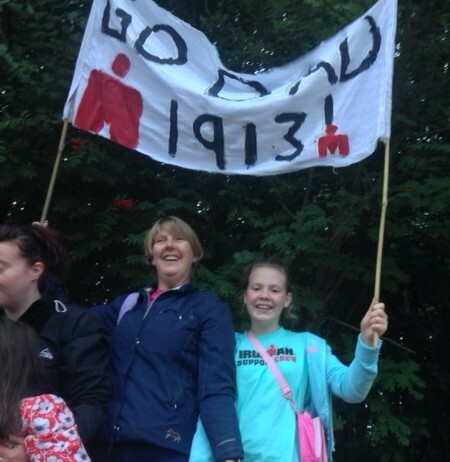 My original plans had been to tackle 1/2 IM next year and IM in 2016, however after getting home after volunteering I knew I had to sign up for the full IM next year which I have done! Thank you for your kind comment…..but more than that, thank you for being a volunteer on the day. The race volunteers were awesome and made the event. You were in a good spot catching people at a high point, all very grateful to get off their bikes!! I am so glad you have entered IMUK for 2015. Enjoy the whole thing from now onwards, it is the most incredible experience. If there is anything I can do to help you on your way, please let me know. Wow. Read parts of that with tears in my eyes. I am doing my first IM in Bolton in 2015 and this was an inspiring read, Hope I have the strength to say Yes when that moment comes! Thank you for your kind comments Kenny. You will have the day of your life in Bolton, it is an awesome event……and of course you will find a way to say “Yes” when required!! If I can be of any help with anything in the build up, please don’t hesitate to ask. You have let yourself in for a treat – a day you will never forget. Let me know if I can help at all.